Home › Dentures › What are the Signs of Gum Disease? Healthy gums will appear pink in color, tight and firm and without plaque buildup. Unhealthy gums will appear red in color, swollen or inflamed and with buildup of plaque or tartar at the base of the gums. A secondary symptom is bleeding of the gum tissue when eating, flossing or brushing the teeth. When your gums are swollen and appear red in color, you are in the stage of the gum disease referred to as gingivitis. Gingivitis, if caught early, can be reversible. When you have allowed the gingivitis to advance, it will cause irreversible changes to the structure of your gums and supporting bone, which will place you in the stage of periodontitis. Periodontitis is when there is bone loss, pocketing around the teeth and, in advanced stages, loose or missing teeth. This is a serious and irreversible condition resulting in the need for periodontal treatment, dental implants or implant dentures. If you are practicing healthy habits daily with flossing, brushing and rinsing, you should not be experiencing either of these diseases. However, if you are not practicing good oral health habits daily, you must take a good look at your gums and see if their appearance is as described for gingivitis or periodontitis. In any instance, it is important to maintain a good working relationship with your Ocean County dentist, Dr. Ron Rotem. 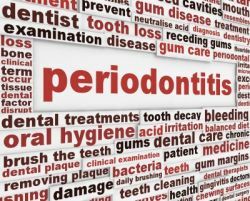 Dr. Rotem can diagnose any stage of gum disease and start you on a regimen to either reverse the condition or aid in the dentistry needed to replace loose or missing teeth resulting from periodontitis. Severe damage to the structure of your gums and bone will require a lot of dental work. To your advantage, Dr. Rotem offers sedation dentistry that can allow more work to be accomplished in a shorter period of time. Call Dr. Rotem today for a caring and thorough exam and diagnosis. If you are experiencing any gum bleeding or tenderness in the gum area, make it a priority to visit Dr. Rotem to check for signs of possible gum disease.